Holiday home in Tenerife insider and tourist guide. "So, why a holiday home in Tenerife and, what is it all about", our children asked us. Explore all about the amazing holiday home in Tenerife. See pictures and videos of a magical island. This island is your key to a fun-filled future with improved health and an abundance of happiness. Venture through the oldest Tenerife resort. Comb through its most nostalgic hub. Admire the former Museum Iriarte which is named after its picturesque street. Do Puerto shopping and sightseeing, all in a day's outing. Not to forget Cafes in Tenerife, some of which are in the Puerto hub. A holiday home in Tenerife is delightfully exotic and was suiting us to a T. "Us" was my late husband and I in 1997 when we were property hunting with friends in romantic Tenerife North, with a rather ambitious two week holiday deadline. You can find information about Tenerife under information facts. The topic 'Our island' in the navigation bar is related to Tenerife property. Why? Your own place is the best way to enjoy it. This is done ideally during all the cold European winter months or several times a year. If this wasn't your choice you may miss out on much. That's carnival and amazing other festivals . Then typical, nostalgic streets of North Tenerife's Puerto de la Cruz start to buzz with folk music or with the sound of Samba and other South American rhythms. 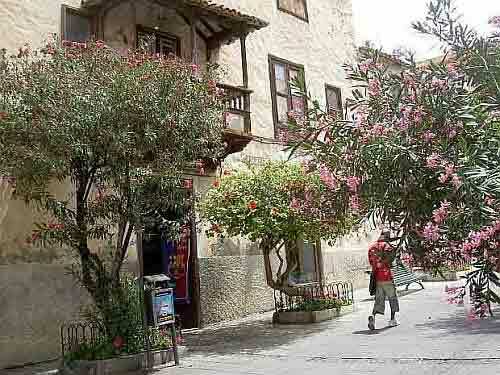 Imagine yourself on Puerto Cruz leisure walks along palm lined coasts and Ramblas where subtropical flowers abound. There, typical Canary houses form part of the hub of the oldest resort. It offers many holiday homes to buy as well as holiday home rental for every budget. Considering full or semi retirement? Look what Claude has to say. Still too young or too busy abroad? Well, there are many Tenerife hotels besides private properties for short vacations. You may even consider outstanding dental services where staff understands your language. And, please, bear in mind I am not a native English speaker. Take strangely spelled words or unusual expressions of mine with a pinch of salt... Excuse American ways of spelling, if you are British... Let me know by my Contact link if there was something that sounded too strange. Dive right into my island adventure and read about an amazing vacation... It was not normal. Besides, the reward for a hunt for residential property was a holiday home in Tenerife. I more and more absolutely love to create my Home Page thanks to services and help I get from my host in Canada with hosting, tutoring and the most supportive and useful forum where I made many friends.